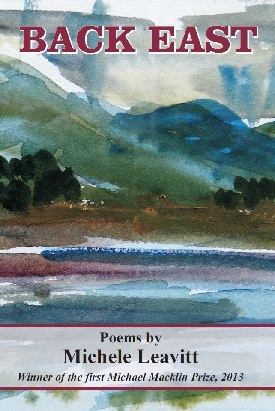 This book won the first Michael Macklin Poetry Book Contest, sponsored by Maine Poetry Central and Moon Pie Press. The contest honors the late Michael Macklin, a beloved poet and teacher from Portland, Maine who died in 2012. It is open to poets from any New England state 40 and older who have never had a full length book of poetry published. We are very proud to publish this book. ..BACK EAST includes a chorus of voices, each making its own hard reckoning on the cliff edge of character and fate, loss and second chance. Leavitt explores our emotional fault lines in language that is lucid and utterly compelling. Among the great pleasures in this book are its fresh perceptions, its moral seriousness and its formal beauty. Michele Leavitt uses the finite resources of poetry--rhythm, form, word choice, sound--to create infinite effects. Her touch is light but reverberant. She has been around numerous blocks and is not only sadder and wiser but more present to the tragicomedy of transience. This is the real thing--intelligence and feeling working together in genuine concert. they are the one tree's vivid myriad. in throwaway garments. Keep us blameless.